November 14, 2018 – SEAL Awards today announced the winners of the 2018 SEAL Business Sustainability Awards, celebrating their leadership and commitment to sustainable business practices. Global brands like Apple, Impossible Foods, Nike, Patagonia, Samsung and Seventh Generation were among those selected for the SEAL Organizational Impact Award. The 2018 SEAL Organizational Impact Award honors the 50 most sustainable companies in the world. 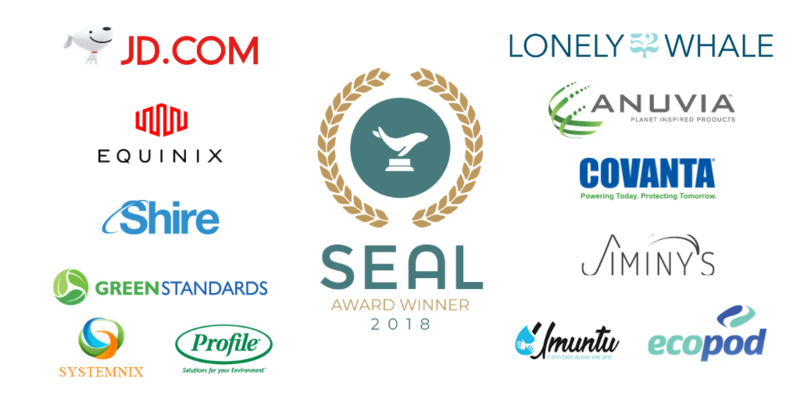 Equinix, Lonely Whale, and JD.com were among the organizations whose sustainability initiatives were recognized with a SEAL Environmental Initiative Award. This award recognizes overall corporate sustainability performance and represents the 50 most sustainable companies globally. The selection process analytically built upon existing sustainability benchmarking databases – including the Carbon Disclosure Project (CDP), Corporate Knights 100, and RobecoSAM Corporate Sustainability Assessment – and individual company sustainability reports. Further consideration was given to companies demonstrating leadership in strategic focus areas – like fashion and food – in acute need of accelerated progress. This award honors specific environmental and sustainability initiatives. Key criteria for selection included: Impact Metrics, Innovation, Sharing of Insights, and Investment Levels. Initiative entry applications were reviewed by a judging panel composed of sustainability executives from leading companies, like AMD, Carnival, Micron, and Sodexo. One hundred percent of the award entry fees raised will be contributed to the 2019 SEAL Environmental Research Grant initiative. To date, the SEAL organization has provided funding to 17 environmental researchers at institutions like Duke, Harvard, MIT, and UCLA. The SEAL Business Sustainability Awards are the capstone of three annual events that honor environmental progress and leadership. The Environmental Research Grant recipients were announced in June. The winners of the Environmental Journalism Awards were announced on November 12. You will ONLY receive email notifications regarding the 2019 Business Sustainability Award winner announcement. The SEAL (Sustainability, Environmental Achievement & Leadership) Awards launched in 2017 and is an awards-driven environmental advocacy organization. Our core beliefs maintain that environmental progress requires true leadership, leadership deserves recognition, and recognition is a form of accountability.